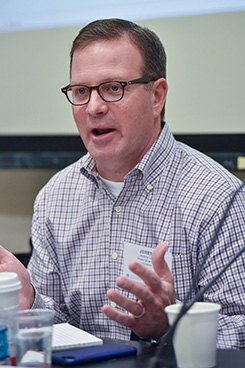 A growing number of states are moving toward marijuana legalization, but product providers are still having difficulties in banking and finding protection for intellectual property, said speakers and attendees to a cannabis law panel held Tuesday at the New York State Bar Association’s annual meeting. Noah Potter of the Hoban Law Group at a panel discussion sponsored by the state bar’s Committee on Cannabis Law held at Arent Fox as part of the NYSBA Annual Meeting. Photo: David Handschuh/NYLJ. While the growth of legal pot may have hit a snag with the recent decision by U.S. Attorney General Jeff Sessions to rescind an Obama-era policy for the federal government not to interfere with marijuana, it is legal for both medical and recreational use in nine states and Washington, D.C., and is legal for other uses in 20 additional states. 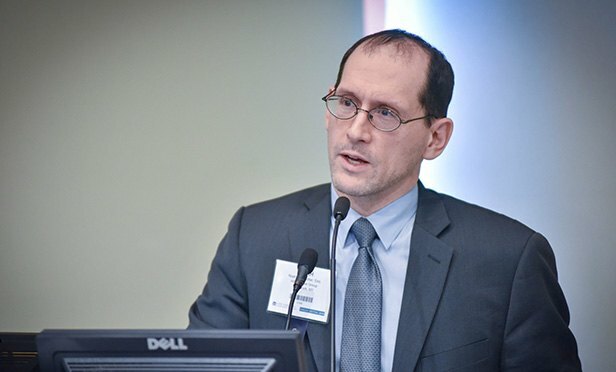 Additionally, public opinion on pot has changed rapidly in recent years and, as Noah Potter, who is of counsel to the cannabis law boutique Hoban Law Group, noted at the panel, the U.S. Food and Drug Administration issued a report in 2016 dispelling the long-held “gateway” theory of marijuana use—that it leads users to go on to try more illicit substances. But despite the spread, most private banks and credit unions are still avoiding the cannabis industry itself as well as turning away would-be investors in the industry, said Aleece Burgio, co-chair of the state bar’s Committee on Cannabis Law and assistant general counsel at McGuire Development Co. in Buffalo. Jeremy Unruh, a panelist at the program and chief compliance officer for PharmaCann, an Illinois-based producer that operates four dispensaries and a cultivation facility in New York, likened banking in New York for the cannabis industry to the Pony Express—there is generally one bank in the Buffalo area that will serve the industry, he said, and it costs about $10,000 per month to maintain an account. Unruh said taxation is also another major issue for the cannabis industry. Under current federal tax law, marijuana companies—because they are trafficking a product that is classified as a Schedule I drug under the Controlled Substances Act—are prohibited from deducting business expenses from their gross income. According to the National Cannabis Industry Association, this results in marijuana businesses paying tax rates of 70 percent or more. “We are taxed just like the ‘Miami Vice’ drug dealer in the cigarette boat,” Unruh said. Anthony Meola, a Purchase-based intellectual property attorney for Schmeiser, Olsen & Watts who was in attendance at the program, said that while producers can obtain patents for cannabis strains and production processes, he said the U.S. Patent and Trademark Office continues to refuse to issue trademarks for marijuana-related products. He said common-law trademarks are available, but that they don’t apply nationwide, and thus clients are unable to collect licensing fees. “We are absolutely concerned with the trademark limitations with these products,” Meola said. Panelist Jeremy Unruh of PharmaCann.